Note: We suggest using the default 2-pane view when working with images; if you&apos;re in 1-pane view the image could move off the screen as you scroll down to read all the comments. An image less than 50x50 pixels won&apos;t have a commenting toolbars; they&apos;re too small to have clearly defined areas, and big toolbars would be visually distracting. 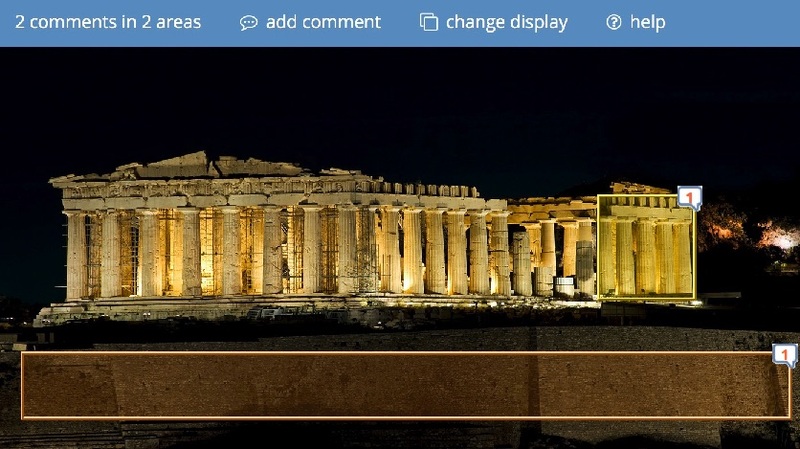 Instead, you comment on it by double clicking the image (or the paragraph number) to make a Whole Image comment; if the comment does relate to a specific area, just refer to that area at the very beginning of the Summary of Comment field. Images less than 50x50 pixels that are by themselves in a NowComment paragraph. 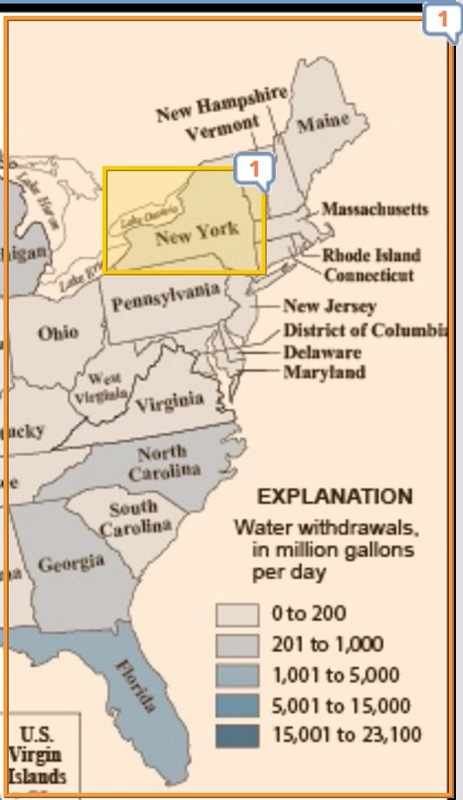 Note— images often increase in pixel dimensions when inserted into Microsoft Word before being uploaded to NowComment, which may cause the toolbar to display. An image larger than 50x50 pixels can have Whole Image comments too. When you comment on a larger image with the toolbar, however, you can also indicate a specific area of the image you&apos;re commenting on, so that afterwards anyone looking at the image can immediately see that that area has a comment (in-context commenting!). The comments themselves appear in the same comments area where text comments appear. 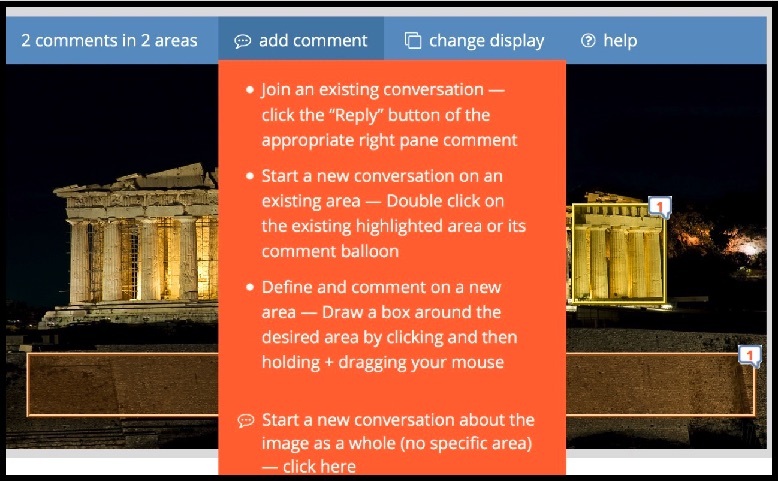 This photo of the Parthenon in Athens has 2 area shown, with one comment on each area, so it reads "2 comments on 2 areas". 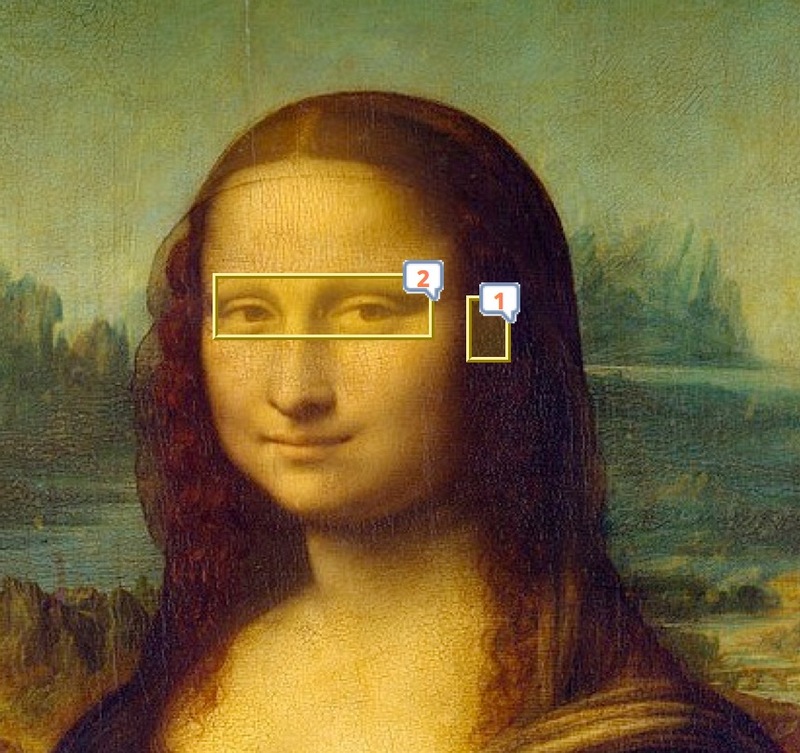 If the Mona Lisa also had 5 Whole Image comments (in addition to the 2 comments on the eyes and 1 on the ear) the toolbar would read "8 comments on 2 areas" ( Whole Image comments are considered area comments). An image that only had 3 Whole Image comments would read "3 comments on 0 areas". Note — we&apos;re experimenting with different field names to both (i) encourage longer, more communicative comments and (ii) convey that if everything you want to say fits in the Comment field then you don&apos;t need to artificially split your thoughts between a Summary field and another field! Areas and Comment Balloons show by default, but this option lets you hide either or both if you want a cleaner look at the original image. Whole paragraph images, both small or large, get paragraph numbers for easy reference; inline images do not. In 2-pane view, if the left pane is so narrow that it can&apos;t display the full width of the toolbar (rare except in mobile devices), then only the leftmost part of the toolbar will be visible until you move the horizontal scroll bar under the left pane to the right to see the rest of the left pane. from the “Advanced Features” menu… or later turn the display on and off as desired by editing Document Properties.